I’ve hit a roadblock. Today, I’m stuck designing a logo that needs to convey a whole bunch of opposing characteristics and tones, while pretty much appealing to every audience under the sun. It’s death by freedom. Don’t get me wrong, I love a challenge, and what I’m coming up with has possibility, but they aren't quite what I know the client is visualising, despite the 'open' brief. ‘What’s this sob story got to do with the imagination of comics or illustration’ you ask? 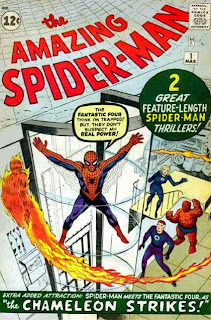 Easy – whenever I’m stumped on a logo design, one of the first sources of inspiration I turn to is the masthead for The Amazing Spider-Man. In my humble opinion, one of the best comic logos ever created (According to Mark Evanier the original Marvel logos, like this one, were designed by production manager Sol Brodsky and inked by letterer Artie Simek). Stopping just shy of breaking the ‘less is more’ barrier, the logo's mixed fonts, slanted almost 3D text, and backdrop spider-webbing, sums up everything you need to know about the hero and tone of his adventures right there. While recent years have seen more ‘modern fad’ impersonations, nothing's stronger than the initial design, which has returned as the masthead over 40 years after it’s creation. I think I’ll post up some more of the best comic logos around in the days ahead, as it strikes me just how much of an essential, yet unappreciated artform it is. What ones stand out to you? For me though, it's back to the roadblock, leaving you with another shot of The Amazing Spider-Man logo, and while I could've cropped MJ out - where would be the justice in that? Where?